Pete had lived at Woodland Park Zoo since 1969. Pete, Woodland Park Zoo’s beloved western lowland gorilla, died yesterday at 50 years old. The male ape was one of the oldest male gorillas in North America and the great-grandfather of the zoo’s youngest gorilla, Yola. As a standard procedure, the zoo’s animal health team will perform a necropsy (an animal autopsy) and the cause of death will be pending final pathology tests in several weeks. Pete had lived at Woodland Park Zoo since 1969. He and Nina were the foundation of the zoo’s gorilla program and were lifetime residents and companions; the pair produced four offspring together, which have played an important role in producing future generations for the conservation breeding program for gorillas in North American zoos. 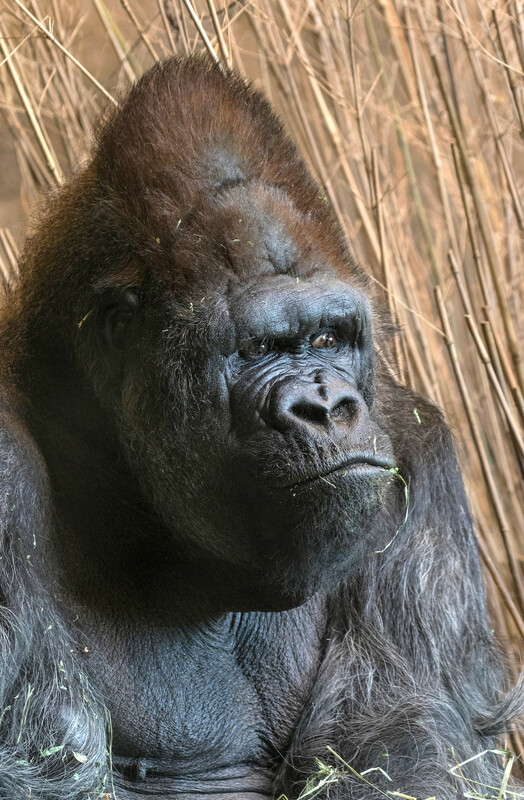 Pete, who also sired a fifth offspring with another female, had 19 grandchildren, seven great-grandchildren, including the zoo’s youngest gorilla, Yola who turns 3 in a few weeks, and one great-great-grandchild. Nina passed away in 2015 due to age-related health issues. At the time of his death, Pete lived with 48-year-old female Amanda, who has lived at Woodland Park Zoo since 1994. After Nina’s passing three years ago, Amanda was moved from her group to live with Pete so he wouldn’t be alone. The gorilla keepers conduct multiple checks daily due to their advanced ages. “They take note of each gorilla’s mobility levels, appetites and fluid intake, how responsive their eyes are, and the condition of their gums, teeth and jaws,” said Ramirez. Animal care staff will evaluate Amanda’s living arrangements to ensure her continued care and welfare. Two other gorilla groups are currently in Woodland Park Zoo’s care: 22-year-old female Nadiri, 18-year-old male Kwame, 17-year-old female Akenji, 11-year-old female Uzumma and 2-year-old female Yola; and 39-year-old male Vip and 33-year-old female Jumoke. The western lowland gorilla lives in seven countries across west equatorial Africa: southeast Nigeria, Gabon, Cameroon, Central African Republic, Congo, Angola and Equatorial Guinea. All gorillas are endangered; the western lowland gorilla is critically endangered. The estimated population of western lowland gorillas in the wild is about 100,000. There are four primary reasons gorillas are endangered. One is habitat destruction caused by logging, mining, and slash and burn agriculture. Poaching for the bushmeat trade, facilitated by logging, has become an immediate threat to the western lowland gorilla population, particularly in Cameroon. Additionally, infectious diseases such as the Ebola virus have recently become a great threat, killing many gorillas; and climate change is causing the drying of the region, creating negative impacts on forest ecology and species. Woodland Park Zoo supports conservation efforts for the western lowland gorilla through the Mbeli Bai Gorilla Study. To help support this important project, drop off used handheld electronics (cell phones, MP3 players, handheld games, e-readers, digital still and video cameras, laptops, GPS, portable hard drives, etc.) at the zoo. The handheld electronics are turned over to ECO-CELL, which operates a strict NO LANDFILL program and reimburses organizations. ECO-CELL reuses mineral ore from these devices to reduce the demand for unsustainable coltan mining in the Congo that destroys habitat for critically endangered gorillas. The zoo will direct funds from ECO-CELL toward the Mbeli Bai Gorilla Study and other African conservation projects. Learn more about the zoo’s wildlife work in Africa and beyond at www.zoo.org/conservation. Fall/winter zoo hours: 9:30 a.m. to 4:00 p.m. daily through April 30. For more information or to become a zoo member, visit www.zoo.org or call 206.548.2500. But there is more to Pete's story. Where was he born? How did he end up in a zoo for his whole life? I may have missed this information in the story, and this article is by the zoo, but I want us to acknowledge if he had a home back in Africa. Sandra, you are an idiot.